Tile tile – environmentally friendly, extremely decorative and wear-resistant material, which will save you from repair for many years. However, it requires regular grooming, weekly wipe and keep away from abrasive (solid particles) and hard brushes. If the tile is very dirty, canwash the tiles with some improvised or specially designed for means. Tile in the kitchen. Wash the tile with a soft sponge (or cloth), soaking it in warm soap or any alkaline solution. After removal of contaminants be sure to thoroughly wash the tiles in clean water to avoid the ugly divorces. 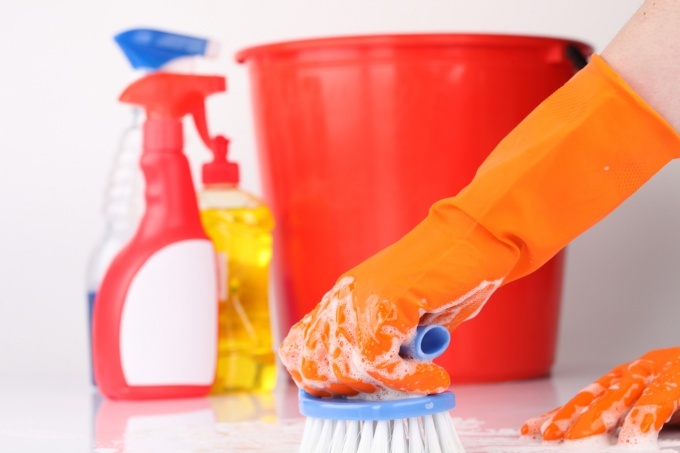 Usually these weekly treatments is sufficient to keep the finished walls or floors clean. If the tile surface was hard for spots, treat them with an aqueous solution of household ammonia and wipe the tile dry with a soft cloth. Grease stains and soot are well removed from the tile, means for washing dishes and other generic liquids and gels that dissolve fat. The tile in the bathroom. It is important to prevent the growth of mold on the seams between the tiles, so please refrain from frequent use of soap solutions on an organic basis. It is best to use an industrial tool recommended for cleaning of premises with high humidity; it is also possible to wash the tiles with water and vinegar or ammonia. Remember to handle the seams with a means to protect against mold. Some Housewives are dissolved in water a small amount of antifungal agent (such as nystatin, natamycin or levorin) and with the effect of the processing liquid, the space between the tiles. Cleaning after repair. Clean the tile after the repair works in the room by using different tools in a large range sold in the stores of finishing materials. Carefully read the instructions for use and pick up essential: used for waterproofing; liquid, removing excess cement mortar and putty, and so on. Refrain from corrosive acids and abrasive powders, not to spoil decorative (especially glazed!) tile and suture material. Lime and putty can be removed and dry – processed contaminated surface cleaner and Polish bright with a piece of felt, wool or a special brush. Frozen lime perfectly washed acidified with vinegar water or using other people's method: add warm water and vegetable oil and RUB this mixture white stains on the tiles. Be careful organics were not included in the sutures. After that you should clean the tile with dishwashing detergent.